Which of the 1100m winners at Rosehill on Saturday was most impressive – the two-year-old Athiri, the three-year-old debutant Kapajack or the Group 1 performer Invincible Star? To the eye the filly was most dominant but the Punters Intel data will tell you the race to focus on may be that won by Hawkes-trained three-year-old Kapajack. On official race times alone, Kapajack ran 1:03.49 while Invincible Star clocked 1:03.55 and Athiri a tick under a second slower in 1:04.54. It’s worth noting Invincible Star led all the way while the other pair settled back. Invincible Star’s first 500m was 29.91, she went out slightly faster than Wooshka (leader in Kapajack’s race) in 29.96 while Nuclear Summit led the two-year-old race in a leisurely 30.21. 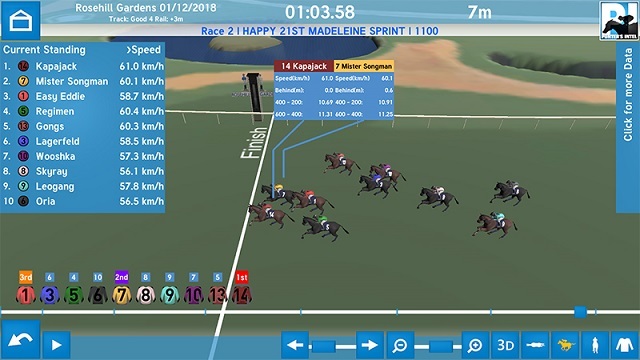 Kapajack’s last 600m was 33.05, clearly the fastest of his race and not far off the best of the day, and he covered an extra 5.8m thanks to his three wide run. His last 200m of 11.05 was the fastest of the day for that section. It’ll be interesting to see if he can back it up because he couldn’t have been any more impressive. A note on runner-up Mister Songman, who was having his first run for the Waterhouse/Bott team. He rode the pace up front and stayed on, he ran the fastest 600m-400m of 10.60 and for a horse whose best form is at 1400m he managed a respectable last 600m of 33.41. The two-year-old Athiri actually ran the fastest final four 200m sectionals in the opening race, though none of them broke 11 seconds, and she was the only youngster to break 34 seconds for her last 600m (33.75). Given no leader had hung on prior to Invincible Star’s victory her effort to keep going had plenty of merit, especially since she went out faster early than the other 1100m events. Interestingly, fourth placed Deploy ran a faster last 600m than her – 33.43 to the winner’s 33.56 – but he knocked up slightly in the last 200m. In a blanket finish, easing favourite Marsupial actually ran the fastest last 600m for the race of 33.21 but gave away too much start. Could a Country Championships contender have emerged in the shape of the unbeaten Noble Boy? We’ll have to wait until February to find out but the four-year-old certainly put his ability on show. He conceded the leader and runner-up Coup De Main 20m around the 800m then reeled off a last 600m of 34.02, which was a second faster than the leader, and broke 11 seconds for the 400m-200m (10.98). A few Villiers contenders stood up in the Group 3 Festival Stakes (1500m) none more than the winner My Nordic Hero who has been reinvented by Chris Waller as a miler. The grey clocked 34.29 for his last 600m as he swept home from near the tail, his final 200m of 11.57 was also a race best. Of those behind him runner-up Goodfella covered plenty of extra ground, 9.8m to be exact, and that just told on him late with a final 200m of 11.88. And Spectroscope signalled he could be a Villiers hope with a solid fourth, running 34.45 for the last 600m including an 11.21 for the 400m-200m which was the race best. Don’t miss Punters Intel with Gerard Middleton, Brad Davidson and Brad Gray on Sky Thoroughbred Central at 7pm Tuesday.